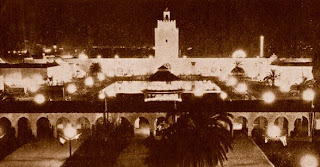 Located beyond the west arcade of the garden-court was the main court of the Pacific Southwest Exposition. 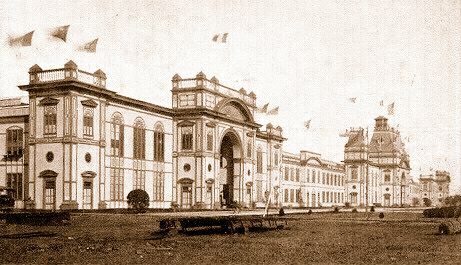 The Palace of Fine Arts, Palace of Textiles & Modes, Palace of Transportation, California Building, and the Palace of Industry all faced this spacious court; with its wide graveled walks, bordered by narrow lawns and many varieties of shrubs. 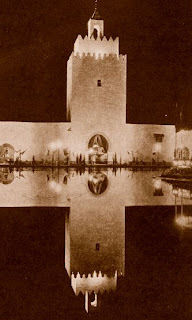 At the center of the court was placed the rectangular Pool of Reflections, which contained a circular bandstand where daily concerts were performed. 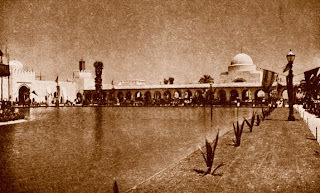 Four exhibit buildings, on the court's north and south sides, featured heavily buttressed walls upon which were located eight colorfully-tiled Moorish fountains. Situated on the west side of the main court was the imposing Muezzin Tower, of ninth-century Mohammedan architecture, from which daily "calls to prayer" were issued, at noon and 6pm, by a costumed Arab. The main court opened to the French Building on the south, located along the Avenue of Nations; and on the north to the Ship Cafe, situated on the waterfront. At night the expansive court was brilliantly illuminated in rainbow hues, by numerous multi-colored floodlights.